Based on information communication technology, as well as wireless and mobile communication protocols, an intelligent healthcare infrastructure builds efficiency across an organisation. Acting as the central nervous system of a hospital, the infrastructure integrates and enables communication between traditionally disparate systems, such as power, building management, security and IT. When a hospital’s systems can “talk” with each other, the infrastructure as a whole is stronger and makes effective use of all resources. In my blog, Two Trends Worth Following when Designing New Healthcare Facilities, I introduced the concept of an intelligent infrastructure and briefly touched on the benefits that extend to patient care and the hospital’s bottom line. In this blog, we expand on this topic with eight specific ways hospitals can benefit from an intelligent infrastructure. Learn more ways to improve the patient journey and hospital financial health in this intelligent infrastructure white paper. 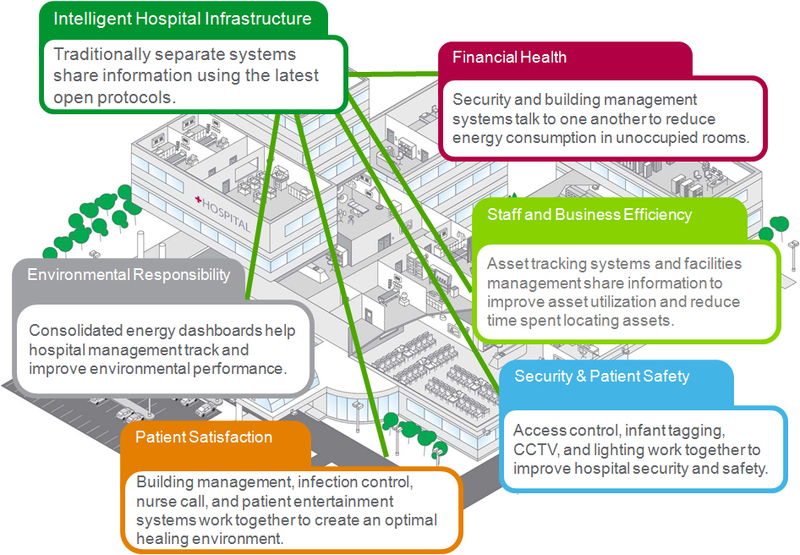 In what other ways do you believe an intelligent infrastructure could help hospitals? What systems do you wish could communicate with each other and why? Share your responses in the “Leave a Reply” box below or tweet us @SE_Healthcare. Indeed great post.Every Hospital should have good Infrastructure. After all customer care is on first priority. Architectural planning and design of applicable healthcare / hospital facilities requires a holistic yet focussed approach and proper understanding of population, healthcare demographics, quality, patient preferences, evidence based outcomes, medical technology, available healthcare professionals, etc. to be able to give birth to a truly effective healthcare facility.